Click here to check out our video on YouTube! 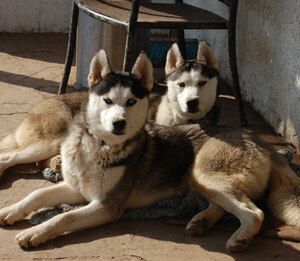 Meet Cooper and Dylan – some of our newest guests at MaPaw. These two boys, estimated to be six to eight months, were found wandering along a road all by themselves. They were frightened to death and cowering from everyone. We knew that their best chance at the family life they so deserved would be to bring them into rescue for a lot of guidance and TLC. Once they arrived in rescue, it took quite a while to encourage the boys to leave the safety of the crate they shared in the van, however, once they saw other friendly husky faces they started to relax. The other pups are showing them the ropes and that people can be trusted. They are slowly and surely relaxing and learning to enjoy attention and affection and being part of their foster home’s household. Please check back for updates on our two boys. We are very excited ~ they have so much potential and wonderful personalities. Their confidence is growing daily and they are fast learning to be happy sibe puppies. Cooper and Dylan are a bonded pair and depend on each other. They sleep together and are never far apart. They will soon be available for adoption, however, cannot be separated.